Exciting and comic events of daily life in the frozen, blizzard swept Antarctic were preserved in pictures by two daring photographers. Here is their pictorial story of a South Pole expedition. FROM Antarctica, the bottom of the world, the Robinson Crusoes of Science have returned with Rear Admiral Richard E. Byrd with tons of data on the greatest expanse of unexplored land on this earth. In the desert of ice, blizzards, and darkness of the South Polar regions the second Byrd expedition gathered more scientific knowledge in eighteen months than all the expeditions to the Ross Sea sector during the last 100 years. The results of the expedition will be preserved in the books and lectures of Admiral Byrd, but even those who can not read can witness the actual adventures, the daily life, and the work of the Admiral and his group of explorers. This record was brought back for millions to see in 135,000 feet of movie film, exposed by John L. Herrmann, chief cinematographer of the expedition, and his assistant, Carl O. Peterson, radio operator. To obtain this pictorial account, the two photographers worked under all sorts of discouraging conditions and occasionally under obvious danger. 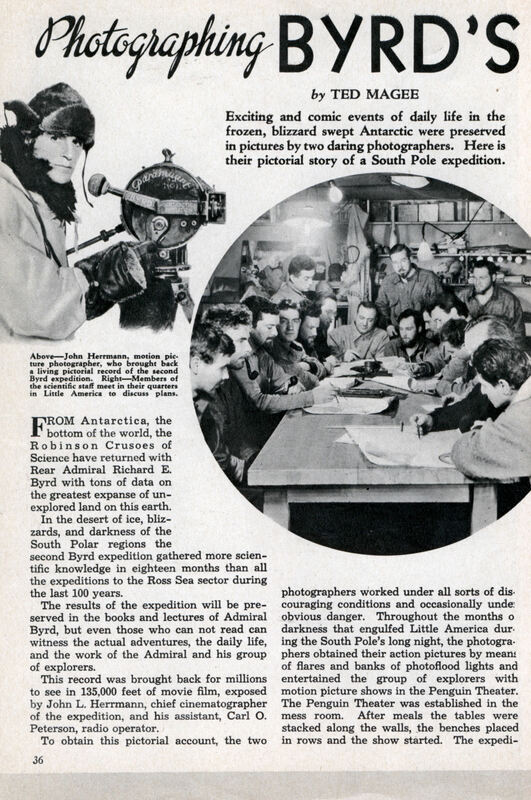 Throughout the months of darkness that engulfed Little America during the South Pole’s long night, the photographers obtained their action pictures by means of flares and banks of photoflood lights and entertained the group of explorers with motion picture shows in the Penguin Theater. The Penguin Theater was established in the mess room. After meals the tables were stacked along the walls, the benches placed in rows and the show started. The expedition carried 97 feature length motion pictures from eight Hollywood studios, in addition to comedies and even a travelogue. Chief Photographer Herrmann said. “When we had shown them all, we voted on favorites and showed them over again. You can be sure that the Penguin Theater had the most appreciative audience in the Americas — North, South, and Little. “When daylight finally arrived, we were anxious to get moving. The first few days of twilight were devoted to digging out from the snow drifts. There was a lot of shoveling to be done and everyone had to pitch in.” After five airplanes were dug out of their igloo ice hangars, the work of aerial exploration began. The expedition brought three of the planes to the Bay of Whales, the other two having been left buried in the ice by the previous Byrd expedition. Before the long night descended on the little colony the hangars were dug into the snow. Rectangular snow blocks were cut and used for constructing the walls high enough to clear the top of the wings. The blocks froze in position. When the planes were towed into place by tractors, the front and rear walls were erected. Bamboo poles were placed over the hangars and covered with tarpaulin to form the roof. Blizzards delayed the work twice, and after the storms the men had to dig the planes out from under the snow. Through the long Polar night, the ships rested snugly under a blanket of snow while the mechanics overhauled the engines in a subterranean shop and installed instruments in the ships. When the sun finally rose again, the planes were dug out. Buried for five years under tons of snow and ice, the Fairchild and Ford ships, abandoned by the previous expedition, were found to be in fairly good condition after excavation. After the planes were dug out of their hangars, the photographers spent a great deal of their time in the air. The two men made 26 flights for pictures. In fourteen months, under the direction of Admiral Byrd and Chief Pilot Harold June, the planes made 142 flights and flew a total of 12,900 miles, using more than 6,000 gallons of fuel and 500 gallons of oil. The fliers, accompanied by scientific members of the expedition, explored more than 100,000 square miles of territory. In addition to obtaining a photographic record of the terrain for study and mapping purposes and carrying instruments for scientific data, the planes themselves were used to determine the topography of the barren continent of Antarctica. Contour lines were obtained by bringing the planes down every twenty miles until their skids touched the snow and surface altitude checked by reading the altimeter. Peterson had his closest escape from death during a trip through Marie Byrd land en ‘ route to the Edsel Ford range by tractor. With three men he had set out to record pictures of the journey. Suddenly, after several days journey, a blizzard sprang up. The wind was suffocating in intensity. As the blizzard grew worse the men pitched a tent next to the tractor, one of them staying in the cab of the latter. The storm grew worse and lasted for a week. The wind blew so hard that it was impossible to venture outside and the man in the tractor cab had to remain in the cab for a week, while the other three took turns holding up the tent. After it was all over, the difficult task then began of digging out from the snow drifts. Herrmann had his one dangerous experience when he broke the camp rules and ventured off alone in the spring twilight. The haze obliterates everything and without a horizon it is very easy to become lost. Herrmann went down to view the seals, and thought he was returning in the right direction. He wore a wool shirt and a windproof —a very light but warm bit of clothing which largely replaced furs for warmth. It was 22 below zero. For nine hours he tried to find his way back. Finally he began back tracking and reached camp utterly exhausted with one foot partly frozen. “Both of us were on the scene when the big Fokker high wing monoplane crashed shortly after taking off,” Herrmann said. “I had to pick up my camera and run for fear of being hit, but the shots we got were both close up and distant. The big ship wobbled as it took off. We had our cameras set to take scenes of general activity. When the Fokker began wobbling, we swung our cameras into position. For a moment it disappeared from sight, then re-appeared very close. We were both grinding away as it crashed. The penguins in the Antarctic are of two general types, the adelie or smaller penguins and the emperors. Some emperors grow to the size of eight-year-old children. Penguins weighing as much as 80 pounds were encountered. Granite-sloped mountains 20,000 feet high separated Little America from the South Pole. On one trip Peterson experienced one of his most thrilling moments when the big Condor’s second motor quit at 16,000 feet while they were heading for the Edsel Ford range. Fortunately, the motor picked up again before a crash occurred. Found Exposed Coal Deposits One party exploring more distant territory found coal deposits lying exposed on the surface. The expedition returned to the United States with conclusive proof that the Antarctic has extremely heavy coal beds beneath its deep cap of snow. Another group reported discovery of three volcanoes which were blowing smoke and fire out of snow and ice. The bitter cold, even in the underground buildings in Little America, made handling cameras difficult. Moisture freezing in some of the instruments made it necessary to keep some of them near a heater until ready for use. One of the curiosities of travel in the Antarctic was the frequent changes of time necessary while traveling east or west from Little America. Every fifteen minutes the men would change their watches by one hour because of the converging latitudes. Peterson Made 21 Flights The cameras were taken on tractor expeditions to supply bases located miles from Little America for the planes on their exploration flights. These trips through blizzards and over dangerous crevasses provided the men with many thrilling adventures. On one occasion Peterson and a group had to dig a tractor out which became lodged in a 35-foot crevasse. They had to build a snow bridge under it and then dig a ramp in the hard-packed snow. 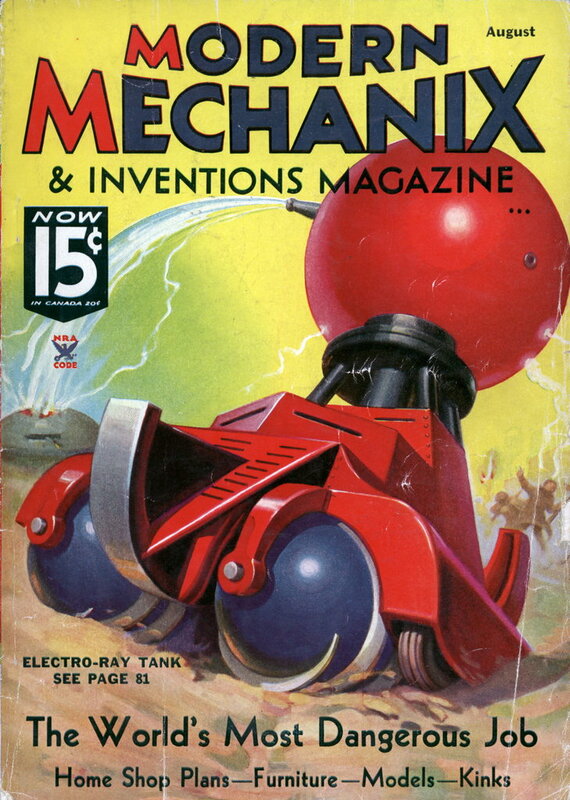 The accident nearly cost the expedition one of the six motion picture cameras. The cameras were taken along on many trips. Peterson made 21 flights with the camera. Herrmann made five. The longest dog team trip by surface was 1,220 miles. One plane flight was approximately that long. The one(the only one I can come up with)upside of living during the Depression had to be the fact that explorers were still amongst teh top celebrities of the day.the people of the era were fascinated with the spirit of adventure and discovery these people exemplified.I really think we’ve gotten way too jaded after fifty years of TV and it’s successor,the Internet.the closest thing we have to Byrd and his adventures are cable TV survivalists.